The Redbacked shrike grows to 18 cm. 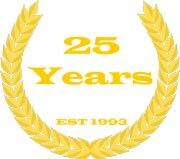 They like to eat insects, small reptiles and nestling birds. 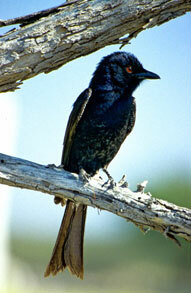 The Forktailed drongo grows to 45 cm and is very common but is very aggressive. They like to mob larger raptors that enter their territory, they also like to follow antelope to catch flushed insects which they mainly eat. The Redbilled oxpecker grows to 21 cm. They are the most common oxpecker in the KNP. They warn their host animals by flying away noisily when there is danger. Redbilled oxpeckers can be found in small groups of 2 - 6 and mostly eat ticks, horseflies and other insects. 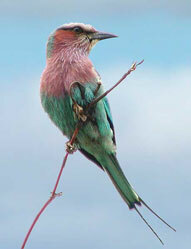 The Brownhooded Kingfisher grows to 23 cm. 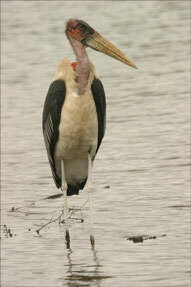 They perch conspicuously to search for prey and are not known to eat fish in the KNP. Instead they eat mostly insects and invertebrates. The Greyhooded kingfisher grows to 20 cm. As it suggests in likes living in the woodlands preferably near water and likes eating mainly insects, lizards, snakes and frogs. This a large bid that grows to 1.5 m. You can only find them where there is enough carrion as they are scavengers. 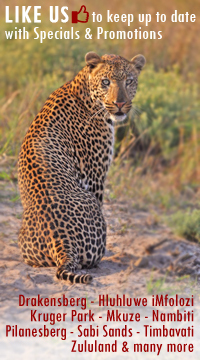 Usually gregarious, also eat birds & fish when large numbers are readily available. The biggest vulture at 1 m tall, which is dominant over other vultures at carcass but do not necessarily compete with them. Their diet includes tough skin & ligaments, small mammals and barbel. 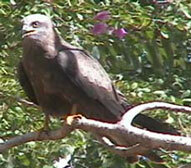 The Yellowbilled kite grows to 55 cm and is a Summer breeding migrant. They scavenge actively especially on roads and at camps. They like to eat carrion, insects, crustaceans, small mammals and reptiles. This is the largest eagle in Africa growing to 80 cm. They hunt on the wing or from a perch, they have very large powerful talons to grasp prey. 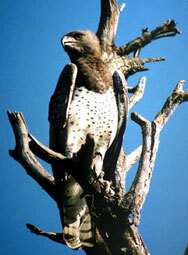 The Martial eagle likes to eat small mammals, reptiles and especially monitor lizards. This eagle grows to 75 cm and has no feathers on its legs, instead, it has heavy scales for protection against snake bites. They like to eats snakes up to 3 m long, smaller lizards and monitor lizards. 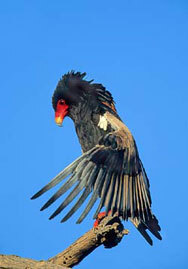 The Grey lourie grows to 49 cm and groups in pairs and small parties. They like to eat insects, leaves and seeds. Go away bird. They grow between 18 and 23 cm and are summer breeding migrants that like to hunt from the perch. They like to eat small insects. The Redbilled woodhoope grows up to 34 cm. It has a loud cackling caul likend to a group of women laughing. They prefer to live in the open Accacia or dense woodland. Their main diet is insects, millipedes, lizards and nectar. The Cardinal Woodpecker grows to 15 cm and has a red crest on its head. They like to eat beetle larvae & other insects sourced mainly from under loose bark. The Goldentailed woodpecker grows to 22 cm and has less red on its head. It's echoing tap is a form of communication and likes to eat ants, larve and other insects. The Ostrich grows to 1 m tall and prefers the grass plains, and is therefore mostly found in the eastern half of the reserve. They like to eat mainly vegetation, grass, berries and seeds. 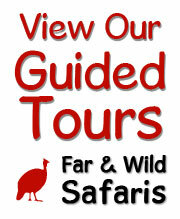 The Helmeted guineafowl grows to 57 cm and has a reddish-brown helmet on its head. It is a highly gregarious bird when breeding. They like to eat ants, termites, arthropods and tubers. The crowned plover gorws to 30 cm and occur throughout the reserve on heavily grazed areas. They like to eat a variety of insects and their larvae.